Officially, Angela Ahrendts remains Apple's senior vice president of retail until April but her successor, Deirdre O'Brien, has already taken up the new post of senior vice president of People + Retail. 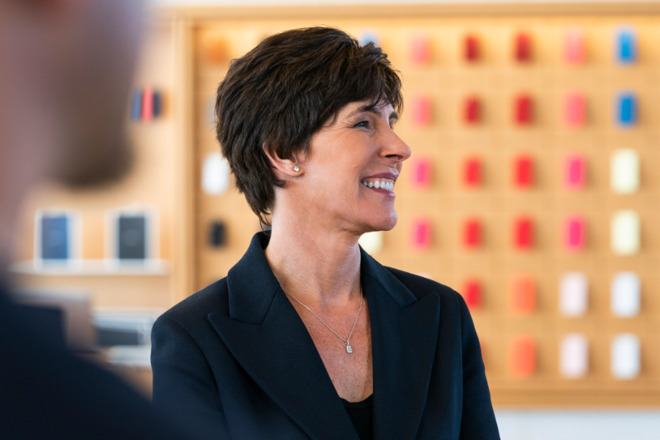 It's a role that has immediately made her one of Apple's highest profile executives, directly and visibly in charge of the online store, 506 retail outlets and some 70,000 staff. O'Brien was already responsible for those, though, and in total for all 120,000 Apple staff in her previous role as solely senior vice president of people. She was promoted to that position in July 2017. "As long as I've been at Apple, Deirdre has been the glue that bonds our operations, sales, marketing and finance teams to deliver products to our customers," said Apple CEO Tim Cook at that. time. "Deirdre deeply understands Apple's unique culture and that people join Apple to do the best work of their lives. She is a superb leader and I'm thrilled she will be bringing her experience and talent to this critical role." Cook joined Apple in March 1998 -- and O'Brien had already been with the company for a decade. After earning a degree in operations management from Michigan State University and then an MBA from San Jose State University, she went straight to Apple in January, 1988. She did not, as now commonly reported, work for IBM first. While she doesn't have a LinkedIn profile or any public resume and also is not mentioned in books about this period at Apple, it's believed that one of her first jobs was to do with overseeing the manufacturing of the Macintosh SE. She was reportedly at Apple's Fremont plant but manufacturing there was not a success and the company closed it down. This does mean that she was already in Apple when it was in decline. Asked much later why she stayed when so many others left, she said that the difficulties were exactly what kept her there. "I stayed because I realized I was learning so much," she told the East Bay Times in 2016. "We were managing a really complicated situation. It's a good skill to have." According to Fortune magazine in 2008, Tim Cook relied on O'Brien's skill in forecasting demand which seems like another operations task but is key to sales. Being able to accurately predict product demand is what meant Apple could reduce its inventory, the stocks of devices made but not yet sold. Cook correctly gets credit for how he managed to cut inventory down at Apple to the point where it no longer held enough machines to supply months of sales and instead had only days' worth. However, with O'Brien, Cook was also able to predict the need for large stocks of what would prove to be high-demand products. So when planning the iPod nano, for instance, Apple was able to make an enormous investment in the storage technology used. That meant both that Apple met its own requirements but also effectively locked out competitors. So despite her training in operations, she has been involved in the details of sales for a long time -- and specifically in the creation and working of the Apple Stores. 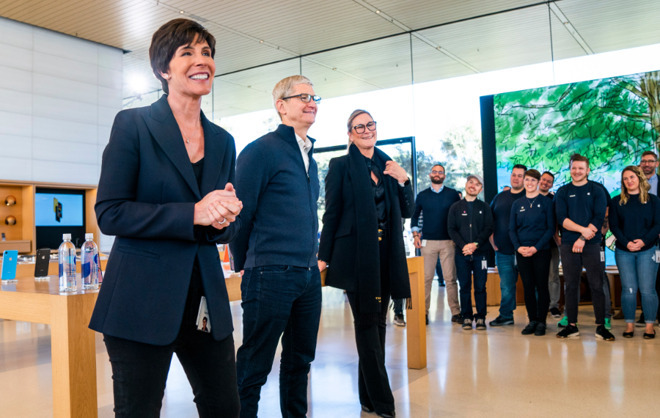 "Deirdre brings insight and experience gained over 30 years at Apple -- decades spent focusing on the connection between customers and the people and processes that serve them," said Tim Cook on announcing she was taking over retail. "Working collaboratively across Apple, Deirdre and her teams empower people to lead with purpose and humanity. "Deirdre was part of the team that planned and launched Apple's very first online and retail stores. She has been a part of Retail's exciting expansion and every product launch since. She knows the value of the deep human connections that retail experiences make possible -- and she knows this is where Apple shows its heart and soul." Cook also said that O'Brien has been directly involved in every major Apple launch of the last 20 years. For the last 17 months, that has at least been in her role as 'VP of People.' She took over that job from Denise Young Smith who moved to the then-new post of vice president for inclusion and diversity. Prior to that HR role, O'Brien had been senior vice president of worldwide sales and operations. Apple has a lot of vice presidents, though, and when she spoke to the East Bay Times in early 2016, she was a vice president working on the supply chain operations team. Apple has a lot of vice presidents, clearly, but each of the specific roles we know Deirdre O'Brien has held have all been a mix of operations and sales-related. She's also an insider, she's someone who has not worked outside Apple. That has to give her advantages over her predecessors like Angela Ahrendts who came into Apple from fashion and John Browett who arrived from the UK's Dixons electronics stores. It must also bring disadvantages, though, as both Ahrendts and Browett were more directly involved with sales in their high-pressure industries. Nonetheless, O'Brien is not going to have problems fitting in with Apple's culture as Browett did. She's on her way to being a lifer at Apple and in 2016, she explained why she likes it so much. "We feel like a small company every day," she said. "We are not worried about protecting things. It's a very positive rather than a maintenance approach." I suspect this predicts a new role for Apple Stores -- away from being mere flashy sales outlets and let them fulfill their original, true function of supporting Apple, its products and its customers. Suppliers of services rather than products. First: Apple is expanding its sales outlets to include more box stores as well as Amazon. That relieves the need for Apple Stores to focus on sales. And, every single one of those tasks is done by PEOPLE, not stores (no matter how many fancy tables or curved glass walls it has). And those people will require abilities and training that go far beyond merely selling a product and taking the cash. So, I predict, with a shift away from sales and towards services performed by people, who would be better qualified to lead the effort than the Senior VP or PEOPLE (not HR) who is so well versed in Apple's culture and vision? You might be right but I also think there is a lot of projection going on. People are taking their feelings on what they think should happen with Apple stores and projecting them onto this new leader. Here’s all the things I don’t like about Apple stores - that must be why Angela is leaving; here’s all the changes Apple needs to make to their stores - surely that’s what this new VP will be doing. Yet nothing in Cook’s employee memo indicated any major changes to retail. Of course I don’t expect everything to stay exactly the same but I also don’t expect things to go back to 2010 either. ‘Genius Bar’ ain’t coming back folks. While Apple has devoted increased resources to expanding its in-store education (Today at Apple), I notice that all of the classes are focused on iOS devices -- and, if you own/use a Mac you're still pretty much on your own. This is an area that an experienced Apple veteran could help improve. O'Brien seems like a good fit -- and may have been a good fit for many years. I wonder whether she was somewhat ignored within Apple because she didn't play office politics with sharp elbows. Yes, projection & self interest is often apparent on these forums. All of which point directly to what I spoke of: A shift away from being mostly focused on sales and towards an expansion of services in the Apple stores. And that, as I mentioned puts a greater emphasis and demand on the employees delivering those services -- thus a Senior VP of People would be best qualified to find and develop those highly qualified people. Added after thought: To put it a bit more bluntly. To effectively turn the whole damn store into an expanded version of the genius bar and minimize the role of the sales clerk -- which is no longer needed. It sounds to me that she was just one of the many quiet players working in the background that made things "just work" at the company. The best companies don't rely on stars -- they come and they go and they fade away. But the best, longest lived companies cultivate and retain the highest quality employees who get the job done without making a splash. After thought: Steve cultivated highly competitive employees. But they were competing in product innovation -- who did the best work, not office politics. BIG difference! I believe that the Mac OS on x86 will be displaced by iOS on A Series, an iOS that supports Mac OS. Apple has 1.2B users running iOS and maybe 200M running Mac OS. It'd be an easy call to launch the "A Series Mac" by 2021 (latest) as the 3rd iteration of the A chip (A15) on 5nm will easily outperform (in power and battery life) the x86 on 10nm. I hope she got the guts to clean up the mess that Angela left behind. While I do not doubt that we will see an "A series" powered Mac (likely the MacBook -- at least to start), I see no reason why it have to be running iOS instead of MacOS. iOS was a simplified interface designed to run on a small, mobile device. But, at this point, the device/screen size, etc. is the limiting factor, not the processor or even the memory. Not a bad thing, despite what you're suggesting. Monoculture offers less value than non-mono, because different perspectives cover more use cases. And yes, even in a diverse culture excellence is still required. It is bizarre that people pretend that hiring non-mono means lowering standards of excellence. It does not. What on earth...? What mess? That the stores are busier than ever? That isn't a mess. Yeah, they're busier than when Ron Johnson launched them -- because Apple is busier. Apple today is much larger and more in demand than the Apple of Ron Johnson’s day. The iPhone didn’t even exist when he and Jobs launched the stores, just Macs and iPods. Now there is iPhone, the most successful consumer good in history, plus iPad, plus Mac, and iPods. That they are more busy and in-demand isn’t a fault on her, just as launch-day order backlogs aren’t a blemish on Cook. Dierdre, bring back the Genius Bar and service counters. Add sound deadening materials. Free water again would be a nice touch. More lounge, less factory floor. The trees and high ceilings. That is literally why they are there. home grow is better than transplant - look like she know the soil well to make apple grow faster in a critical time - just before the new 5G show up. Her HR background will be handy to bring back tech superiority as serves center used to be at Apple store (used to skip lunch during San fran conference to attend training course - with noisy stomach... collect "final cut pro" training DVD at launch event hosted by apple... still has them somewhere in my room.. walked in have a chat with staff and figure out what would be the best bet for upgrade path). With new OS, new 5G software, tech support might need some heavy lifting (not the staff want to chat with grandpa can use "face time" to enhance "life experience" ;-(. IMHO. Shes one of the few who suffered through the fall of Apple in the 90s. She's gonna be killer. Hopefully she opens the most Apple Stores ever. 1-3 per city ain't cutting it. They've become so crowded.Apple can be the new Best Buy, except they control the whole operation from hardware to sales. Also wondering how a shift to digital services will affect Apple Stores? That may be what you want. I don’t think either of Cook’s memos/letters suggest that.